Details from (l-r): Studio of Lucas Cranach the Elder (attributed to Lucas Cranach the Elder at the time of acquisition), 'Saint Christopher'; Anonymous German sixteenth-century artist, Upper Saxony School (attributed to an Early Westphalian Master at the time of acquisition), 'Portrait of a Woman Aged Twenty-Two'; Follower of Hieronymus Bosch (previously attributed to Joachim Patinir, Henri met de Bles, Jan Mandyn and Gillis Mostaert), 'The Descent into Limbo'. Studio of Lucas Cranach the Elder (attributed to Lucas Cranach the Elder at the time of acquisition), Saint Christopher. NGI.973. Anonymous German sixteenth-century artist, Upper Saxony School (attributed to an Early Westphalian Master at the time of acquisition), Portrait of a Woman Aged Twenty-Two. NGI.974. Follower of Hieronymus Bosch (previously attributed to Joachim Patinir, Henri met de Bles, Jan Mandyn and Gillis Mostaert), The Descent into Limbo. NGI.1296. In 2012-13, the National Gallery of Ireland (the “Gallery”) received two separate claims for restitution of certain paintings in the National Collection that had allegedly been sold under duress and/or looted during the Nazi regime. The Gallery was requested to either return these paintings or conclude a settlement conforming to the 1998 Washington Conference Principles on Nazi-confiscated Art. While Ireland was not a participant in the Washington Conference, the Gallery supports the consensus achieved at that Conference that museums and galleries should seek to achieve a just and fair solution to ownership issues, while recognising that solutions may vary according to the facts and circumstances surrounding a specific case. The Gallery engaged in extensive internal research since the claims were received and commissioned a private provenance researcher with vast international experience in researching restitution claims to conduct further investigations into both claims. The first claim was submitted on behalf of the heirs of a couple who owned various businesses before WWII, among them a successful art gallery in Old Master paintings in Berlin. 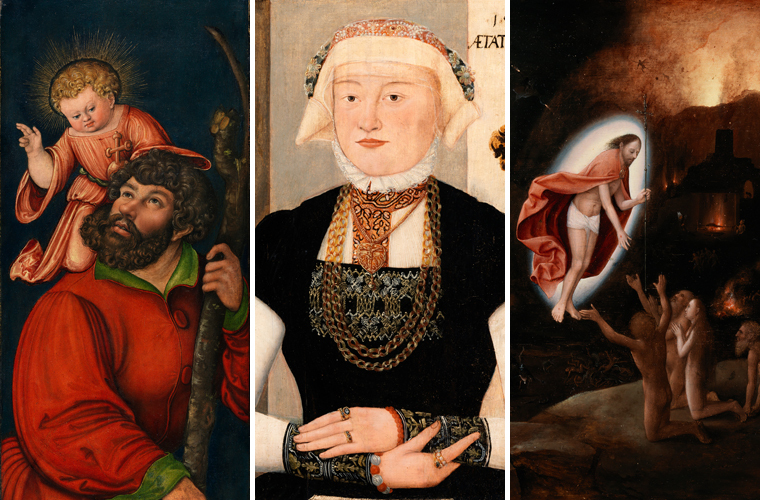 The Gallery acquired two sixteenth-century German panels from this gallery in 1934; one by a member of the studio of Lucas Cranach the Elder and one by an anonymous painter from the Upper Saxony School (NGI.973, 974). The claim asserts that the paintings had been sold under duress, as the couple had been persecuted by the Nazis from the beginning of 1933, and that the sum of £1,250 paid for the paintings was not paid to the Berlin art gallery, but was instead confiscated by the Nazi Government. The commissioned research focused on the context in which the paintings had been sold by the Berlin gallery. The research acknowledged the appalling circumstances that led to the tragic fate of the couple, but also details other circumstances they faced, independent from the political climate in Germany in the 1930s. Extensive research within the Gallery’s own curatorial files suggests that the acquisitions were carried out in line with regular museum practice at the time. As was common, the Gallery sought and received a discount, but the final prices paid were in line with those spent on other northern European paintings in that period. Moreover, it is of note that the painting by a member of the studio of Lucas Cranach was the second most expensive northern European painting bought by the Gallery during that period. In conclusion, the research does not support the contention that the two paintings represent looted art or that the sums paid were the proceeds of forced sales that were subsequently confiscated by the Nazi regime. In the absence of such evidence, the Gallery has no option but to decline the request for either the return of, or a settlement in respect of, the aforementioned paintings. The second claim was submitted on behalf of the heirs of a French art dealer who had been active in Paris before WWII and who originally owned The Descent into Limbo by a follower of Hieronymus Bosch (NGI.1296). The dealer left Paris after it was occupied by the Nazis, but before he did so, he deposited thirteen paintings at a Parisian bank. These paintings were confiscated by the Einsatzstab Reichsleiter Rosenberg in 1941. After the war, the dealer gained restitution or compensatory payment for 12 of the 13 confiscated works, but appears to have made no effort to pursue the restitution of The Descent into Limbo, notwithstanding that it was well-known that it was in the collection of the National Gallery of Ireland since 1954. The Gallery acquired this painting in 1954 from art dealers Agnew & Sons in London as a work by Jan Mandyn. On enquiry by the Gallery at that time, Agnew’s contacted their Swiss agent who indicated that the painting had been in the possession of ‘Heinemann of Wiesbaden’, most probably Gallery Wilhelmine Heinemann. The commissioned research focused on the whereabouts of the painting between 1941 and 1954 and the French art dealer’s professional relationships during and after WWII. The research suggests that rather than holding a large stock, he sourced discrete works of art and purchased them for and with others. It also shows that he purchased the painting in 1939. Following its confiscation, the painting was retrieved from the German authorities in 1941-42 by a German art dealer with whom the French art dealer had longstanding business ties. The German dealer obtained the painting by claiming that he had partial ownership of it together with the French art dealer. The German art dealer appears to have retained the painting at his home in Switzerland throughout WWII and still had it in his possession in 1946. The German art dealer returned at least one other painting to the French art dealer in the post-war period. After WWII and a period under arrest, the German art dealer returned to his home in Switzerland in 1950. The location of the painting during these intervening years is unknown. The research indicates that intensive efforts by the French and Swiss authorities on behalf of the French art dealer to have his works restituted ended abruptly and without explanation in 1950. Soon after, the painting was sold to an anonymous buyer at an auction in Lucerne. There is no trace of an official claim being pursued after December 1950. The painting was regularly illustrated and published since the Gallery acquired it in 1954; yet the French art dealer, who lived until the late 1970s and continued his Nazi-era claims until the early 1960s, does not appear to have pursued an official claim for this painting. The research indicates that shared or fluid ownership of works of art between the two dealers, as well as others, was an ongoing practice over many decades. The silence of the French art dealer in question after 1950, despite years of restitution efforts, suggests the possibility of a private resolution having been reached between him and either the German art dealer or the anonymous buyer of the painting in 1950. On the basis of the internal research, and the findings of the external provenance researcher, there is not sufficient evidence to accept the claim at this time. While the Gallery is hugely sympathetic to the history attaching to all three paintings, to the tragic circumstances following the sale in 1934 and the confiscation in 1941 and to the claims being made on behalf of the heirs to the estates in question, it cannot exceed its authority or avoid its obligations to protect the National Collection. The Board is established under statute and has responsibilities as trustees of the National Collection. The Board is precluded from deaccessioning works from the Collection, public monies have been expended on the acquisition of the paintings and the Board could only make a recommendation to return the paintings or to engage in discussions about a settlement if the entitlement to restitution was established as a matter of probability. Future research might provide additional evidence. On this basis, the Gallery would welcome any further material information that would contribute to the collective knowledge of the circumstances surrounding the sales of the two sixteenth-century German panels in 1934, the relationship between the two art dealers involved with The Descent into Limbo, the ownership of that work, the reasons why the claim for restitution or compensation was not pursued after 1950 and the possibility that a private resolution was reached after the 1950 auction.